I arrived here from the wiki on vinyl myths. Here's a spectrum of a recording of a vinyl record. What do you make of this? Does this show that vinyl records include content above 20 kHz, as has now been added to the wiki (it wasn't in the wiki a while back). Does anybody know the references to the information about supersonic content on vinyl records? 1) It's extremely faint, in a frequency range where even very young humans have very little hearing capability. 2) It's very likely to simply be noise. Instruments are designed to produce sound in the normal range audible by humans, not in the ultrasonic range. Does this show that vinyl records include content above 20 kHz, as has now been added to the wiki (it wasn't in the wiki a while back). But the topic is does it "really matter" which I take to mean "is there anything really there and is it perceptible?" To my knowledge no one has demonstrated that humans can reliably detect the absence of these frequencies. Prove it to yourself: take that 24/96 file and make a copy that is low-passed at 20 kHz. Run them both through foobar2000's ABX Comparator using your best headphones. Take as much time as you want. How do you score? What you're looking at is a spectrogram of the signal coming out of a vinyl reproducing system. There is clearly spectral content above 20kHz, albeit at very low levels. 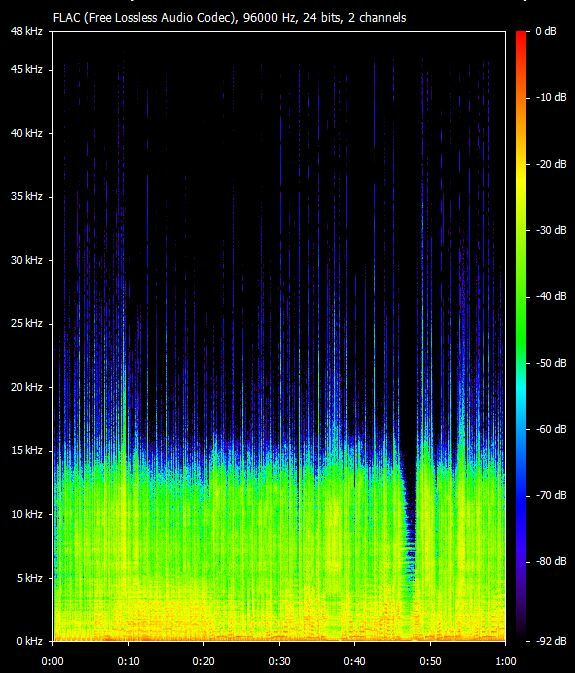 One of the many things a spectrogram does not tell you is what that content consists of, and more importantly, was it there on the master tape from which the master lacquer was cut, and even more importantly, was it there in the studio. Even if you could answer "yes" the the content on the master and present in the studio, the next question would be: has it been altered in any way? The most probably answer to the question of ultrasonic material on the master is that whatever the ultrasonic content is, it is not intentional. It's either noise or distortion products, as analog tape does not have spectacular ability to record and accurately reproduce ultrasonic content, but does have a spectacular ability to generate distortion products and noise. Past that, the question of the total vinyl system accurately reproducing distortion products and noise is a bit moot, because the system has it's one spectacular ability to generate more of both. Just a bit of mistracking of a 10kHz signal produces third harmonic distortion at 30kHz, and that wasn't even recorded on the disc. Recall that 1% harmonic distortion products are only 40dB down. Mistracking can be much higher than 1%, level and frequency depending, and analog tape can be as bad or worse. Noise voltage increases with frequency, and the noise shown is reasonable and expected from both media types. So yes, the ultrasonic content is there, no it's not part of the original signal. ^ CRT "whine" at just under 16 kHz is not even ultrasonic. The CRT horizontal sweep waveform is not a sine wave, it's a sawtooth, very rich in harmonics. Second harmonic of 15.75kHz is 31.5kHz, third harmonic is 47.25kHz. Passive coupling of that to an analog circuit would favor higher frequencies. The fact that distortion is undistinguishable from the audio signal on a spectrogram, leaves interesting opportunities to market distorting playback gear as being more audiophile, because it shows more high-frequency "signal" on the spectrogram. In other words, to sell crap at higher prices. So, audibility aside (I've already done blind tests and couldn't hear any difference), do you guys think it's accurate or relevant that the wiki on vinyl myths now include that vinyl records contain reasonable amounts of content above 20 kHz? When I saw this new information I was a bit confused, as I see now that what I missed was something like "although vinyl records often contain content above 20 kHz, this content is mostly noise and distortion either generated from storage equipment in the studio or from the vinyl playback chain itself". It does say something a little bit similar afterwards, but I was still a bit bewildered. Also, another thing was added, which was a study that showed that many instruments played content above 20 kHz (most notably cymbals). So, if we consider a case of an album recorded digitally at 24/96 and then cut to vinyl, then the vinyl might (or might not?) contain higher frequencies than the CDs...? Relevant to what? Of course, stuff you can't hear is NOT relevant if your goal is listening to the record (or a digitized copy). Also, another thing was added, which was a study that showed that many instruments played content above 20 kHz (most notably cymbals). There is no "filter" or limit on acoustically or naturally generated sounds, so a cymbal or other instruments may generate "sound" beyond the range of human hearing. I'm bumping this topic after a long break, as I forgot about the thread. I think Greynol is mainly the person editing the vinyl myths wiki entry, so hopefully he reads this. In any case, I still find the following quoted section a bit confusing and contradictory (I highlighted what I found most confusing/contradictory), and I didn't see any references to these claims (which are fairly recent). A quick Google search didn't reveal anything that backed up the claims of "common 23-24 kHz audio content at significant amplitude on vinyl records" (but a more thorough search might reveal this). I still haven't found any concrete evidence that shows that vinyl records have actual musical content to 23-24 kHz, where it is shown that the peaks above 20 kHz are actually music present on the master it was cut from, rather than just noise or distortion. tests have been conducted which deonstrate that a record can be played up to 1000 times before there is any measurable increase in distortion as a result of record wear. There are rarely, if ever, any ultrasonic frequencies for vinyl to preserve. In audio recordings, such frequencies, when present, are normally low-energy noise imparted by electrical equipment and storage media used during recording, mixing, and mastering. Although some musical instruments can produce low-energy overtones in the ultrasonic range, they could only be on the vinyl if every piece of equipment and storage medium in the recording, mixing, and mastering stages was able to preserve them—which is unlikely even in modern recordings, since the average microphone or mixing console is designed only with audible frequencies in mind. Even if the overtones were preserved all the way to the mastering stage, mono and stereo lacquer cutting equipment typically includes a low-pass filter to avoid overheating the cutting head with ultrasonic frequencies, however the commonly found audio information up to 23-24 kHz is still present at significant amplitude on vinyl records. How about sending your hi-res files or test signal to a vinyl cutting service and verify it yourself? Remember to film the whole process then upload to somewhere like Youtube or Facebook. Maybe you can even earn a lot from audiophool product sponsors by doing this! Please... back off with the attitude :-). I'm of the impression/conviction that vinyl doesn't contain (much) content above 20 kHz, and what it does contain is noise/distortion. Therefore I find it confusing/misleading that the HA wiki says that it does contain supersonic audio, but the wiki doesn't provide any sources for this. In other words: I don't think the wiki should include this phrasing if there's no evidence to back it up. That is after all the golden rule of this website: evidence. I think you are and I on the same side. I am perfectly aware that vinyl is the least transparent media available today (if we leave out cassette tapes). That is not my point. My point is simply: Why is the above (supersonic musical content) included in the wiki if it's not substantiated? And just to make it clear: I don't care whether an audio signal contains audio content above 20 kHz or not. I have already done ABX tests of hi-rez vs. CD quality and couldn't hear any difference. That is still beside the point. It has nothing to do with attitude. You want to find evidence right? I am merely suggesting a method so that you can prove it yourself. As I stated in my previous post already, I only care about transparency, whether vinyl can or cannot have real signal above 20khz is unimportant to me. I am not speaking for the wiki or greynol. At least we have to agree if the format itself is capable of recording content over 20kHz. I mean I'm pretty sure if you would record from a digital source (that has content way above 20kHz) a Vinyl at double speed it would be all recorded accurately (same goes for tapes I guess too). Now how much the format itself as-is can retain frequencies above the 20kHz range it's a subject that is hard because I feel like the mastering/pressing, conditions and quality of Vinyl material play such a huge role that is hard to base an opinion from a variety of random releases over the years. You would need to answer with having in mind the best case scenario, which we need to agree first what is the best case scenario? At least we have to agree if the format itself is capable of recording content over 20kHz. That's certainly possible. More than 50 years ago there was a wave of quadrophony (which died within a few years). Some of the various methods of recording quadrophonic sound onto vinyl used ultrasonic frequencies. So there you have a kind of practical proof of its possibility. The fact that it died rather quickly can be taken as a hint that it probably wasn't such a good idea. As is often the case with analog, the question of whether the LP can record ultrasonic frequencies is not a yes/no question. It is a question that depends on levels, frequencies, distortion and longevity. Commonly there is audio content up to 23-24 kHz on many vinyl records. That does not say whether it is information or noise. the average microphone or mixing console is designed only with audible frequencies in mind. Even if the overtones were preserved all the way to the mastering stage, mono and stereo lacquer cutting equipment typically includes a low-pass filter to avoid overheating the cutting head with ultrasonic frequencies, however the commonly found audio information up to 23-24 kHz is still present at significant amplitude on vinyl records. The only outright "contradictory" I could see here, is the use of the term "information" for what could just as well be disinformation, nothing informative, just noise. No idea about the factual statements though. Do really modern mixing consoles cut off above 22 kHz? I am not speaking for the wiki or greynol. So why are you bothering enough to post those replies? Curiosity. I rarely read the wiki but someone pulled this out. For example, how about the 1000 times playback test? What if someone record a RMAA signal on a vinyl and test it? By saying unimportant in my previous reply, I mean I will not feel sad, proud or angry if the performance of vinyl is better or worse than what I guess, it doesn't mean I am not interested to know about the result. It's more or less like watching someone buy a McDonald's meal then put it aside for months and see if the food rot or not. The result will not affect my future McDonald's purchase anyway, but it is fun to watch. My previous replies are pretty short, but then I really spent some time to answer your question. I am not the keeper of that page. I have made edits and will likely continue to make edits where I feel I can make a difference. People are more than welcome to review my edits. I have locked it down in the past and make no apologies about it. The HA wiki should be a reflection of this community and its guiding philosophy. It is not a platform for unsubstantiated nonsense by audiophiles with no history of participating in forum discussions. That basically sums up my beef with the content of the wiki at present stage: It seems to me to say explicitly that any content above 20 kHz on vinyl records is "musical content", not just noise or distortion, and that vinyl records commonly contain this "supersonic audio content", but I don't see any references to any kind of proof. And that's what I was basically trying to get at, but which Greynol said straight out: Are the claims in the wiki of vinyl records commonly containing audio information above 20 kHz put in there by an audiophile with an axe to grind, but who has no proper evidence to back it up? The way the wiki looks now, to me it looks like these claims were simply put in there by an audiophile, but if anybody can back it up, then we should of course allow it. I've seen some of the edits that have been made to that wiki in the past and some were definitely needed, as there were silly comments like "I can't listen to this digital crap, but I can listen to a record anytime! ", ha ha ha :-D! Anyway, that's my beef: Is the content in the wiki correct or just audiophile propaganda that can't be backed up? That questions must also be asked of "a record can be played 1000 times without distorting". I included that part in my quote as I didn't see any references for this either, nor could I find any by a quick Google search. As for "can vinyl records contain supersonic content", I find that discussion pointless, because as Pelmazo points out, the CD4 quadrophonic system (which is also mentioned in the wiki) needed supersonic content to work properly, but according to Arny this system never made it out of the prototype phase if I remember correctly. In any case, I believe it has been proven at some point (I don't have a reference at hand) that vinyl can contain supersonic frequencies, so therefore the debate is pointless. But what is more relevant is how much supersonic musical content does it contain? The wiki says it's of "significant amplitude". This is just an opinion, but I believe that the records that actually do contain supersonic musical content would contain something like 1-5 % supersonic content at very best. Also, I believe that maybe 90 % of vinyl records contain no supersonic content at all, as they have been cut with a low-pass filter that gradually cuts off high frequencies. Where this cutting starts varies from album to album, but it's my impression that usually it starts around 15-18 kHz and cuts off completely at 20 kHz at the very latest. So, where I do think I agree with bennetng is that we need some proper proof in the way of a master, whether digital or analogue, that has been shown to contain supersonic frequencies and then it has been cut to vinyl, and the vinyl record contained these supersonic frequencies, and it didn't show up as distortion. As simple as that. Without this proof, I don't see why the claims of "musical content up to 23-24 kHz is common on vinyl records" should be in the wiki. I'll bump this topic, as I'm still hoping that someone can shed some light on the topics I raised in my previous posts. I tried looking through the revision history of the wiki, but couldn't figure out who had added the points in question. So, just to sum up, I'm asking if we have proof for the following (if so, please share :-) ), and if we don't, should they be removed from the wiki? If we cannot find a proper answer to these questions, it's not the end of the world but it would be nice to have it settled :-). I'd say a record can't be played once without distortion? ...Without audible damage, I really don't know. I'm pretty sure I never got through 1000 plays without damage, although I tried to be very careful. I doubt I played any of my records 1000 times, but they all seemed to "deteriorate". I assume this was mostly from human handling, and possibly from dirt/dust rather from the wear of the stylus. Without having the master tapes (or digital masters) you can't possibly know if any noise/harmonics were generated as part of the vinyl production/playback process or if they were present acoustically or generated somewhere else in the production chain. It could also be helpful to know what filtering was used ahead of the cutting lathe. There are certain types of noise & distortion associated with vinyl. I suppose you could analyze/characterize the supersonic "information" to see if tends to match the usual vinyl defects/limitations. But, that wouldn't give you 100% certainty. As a practical matter, we know records are not perfect (worse than human hearing). And, we know that you very-rarely find an old used record that sounds as good as when it was new. We also know that frequency response can be perfectly adequate, regardless if it extends into the ultrasonic. However, the "frequency balance" can vary quite a bit from record-to-record, and different phono cartridges have different frequency response (sometimes audibly different). A needle is grating through grooves made out of PVC. The condition of the needle, configuration of azimuth, counterweight, etc. all play a role. There are countless possibilities for vinyl playback to be imperfect or outright wrong. All of these imperfection create stress for the record and the parts reading it. And I've yet to see a turntable/tonearm/system to 100% perfection. So that argument seems invalid to me. Though, if you can hear the effects of degrading is another question. From my own experience? No. Musical content above 20 kHz is the (rare) exception, not the rule. I recently bought an Audio Technica AT-120 as a present for my husband. I then used it to record countless vinyl records from our collection (he loves vinyl, I just kept mine from my youth and bought new ones because of their looks). Out of roughly 40 vinyl records I found just two that had clearly visible content above 20 kHz not created by distortions of any kind. One was Guilty by Streisand, the other The Works by Queen. The latter album is a brand-new pressing. And the content is only there because it's half-speed mastered. Content above 20 kHz is difficult to cut as the needle cutting the father needs to vibrate fast. This creates heat which ages the cutting needle faster. So it's usually avoided and therefore material is bandwith limited before cutting. In case of the Queen album a comparison was easy, as the master for the vinyl was the same one used for the SACD. The only difference was that high frequency content for the vinyl version was attentuated. Still there but softer. Even if we could hear it, it would be pointless as it was almost buried within noise. Albums from the '80s? For all of them a 20 kHz cut off, indicating a digital 44.1 kHz master, was clearly visible. Some even looked like they had been cut using a digital 32 kHz master. Either that or some early digital synths/samplers were used during production of those albums.